"The Industrial Grade, Fire-Rated Solution for 1/2" or 3/4" Rim Exit Devices"
- Select Function: Fail Secure or Fail Safe. - Select Optional Features: Latchbolt & Locking Cam Monitor with Auxiliary Switch (LCBMA). - Select Voltage: 12VDC or 24VDC. - Delivery: The Folger Adam 310-4-12D-630, 310-4-24D-630 & 310-4-F-24D-630 are In Stock. Please allow 2-3 days' lead time on all other functions. The 310-4 Series is a 3 hour fire-rated, industrial grade electric strike designed for extreme heavy duty applications. The all stainless steel construction of this device makes it ideal for high abuse applications that would disable other electric strikes. The 310-4 has a unique 3/4" faceplate with an integrated 1/4" base shim that can be removed in the field to accommodate rim exit devices with a 1/2" or 3/4' throw latchbolt. 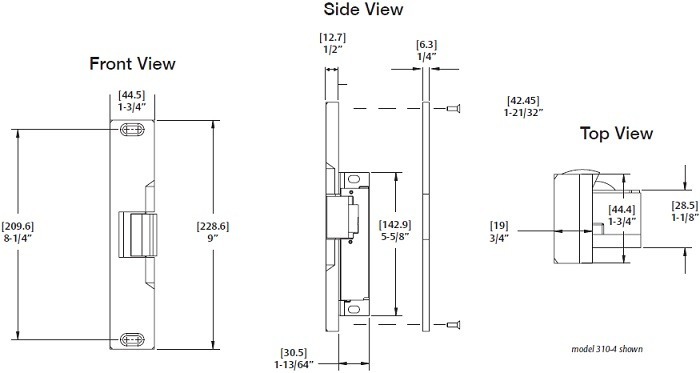 This industrial grade electric strike is used with rim exit devices with up to 3/4" pullman style latchbolts used on single door openings or at the top of a surface vertical-rod exit device. Note: PK keeper standard. - Integrated shim for quick customization of faceplate thickness (1/2" to 3/4"). - Tamper-resistant, heavy duty construction. - Constructed entirely of stainless steel for strength and corrosion resistance. - Endurance rating 500,000 cycles. - Integrated ramps for better deadlatch handling. - Set screws for horizontal lockdown. - Wider faceplate (1-3/4") for greater versatility. - UL 10C, 3-hour fire-rated (fail secure only). LCBMA - Latchbolt & Locking Cam Monitor with Auxiliary Switch: Monitors when the latchbolt is projected into the strike pocket. Delivery: The Folger Adam 310-4-12D-630, 310-4-24D-630 & 310-4-F-24D-630 are in stock and available to ship. Please allow 2-3 business day lead time on other functions.